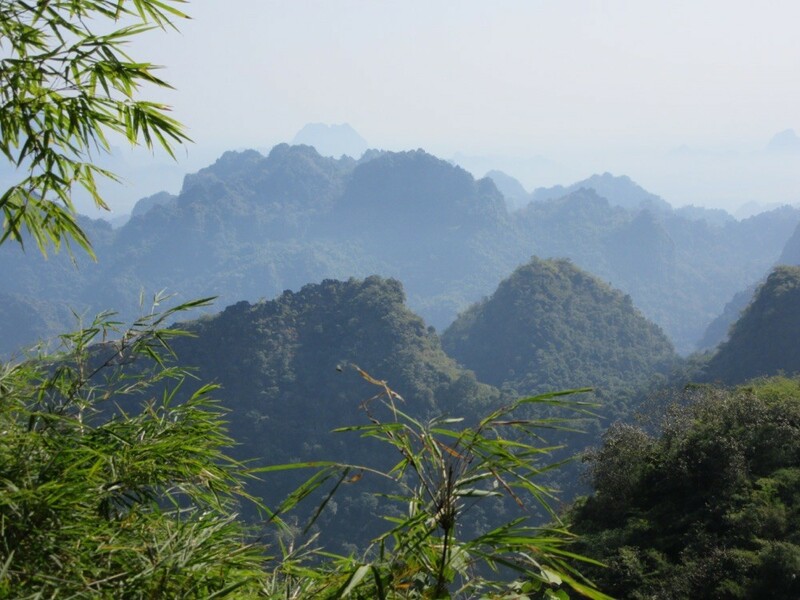 So now we are in Myanmar and, sorry that I have to say it, we cheated the first day because we took the minivan to Hpa An, the first bit was hilly and then the rod was so narrow and in poor condition that we thought it better to stay safe. 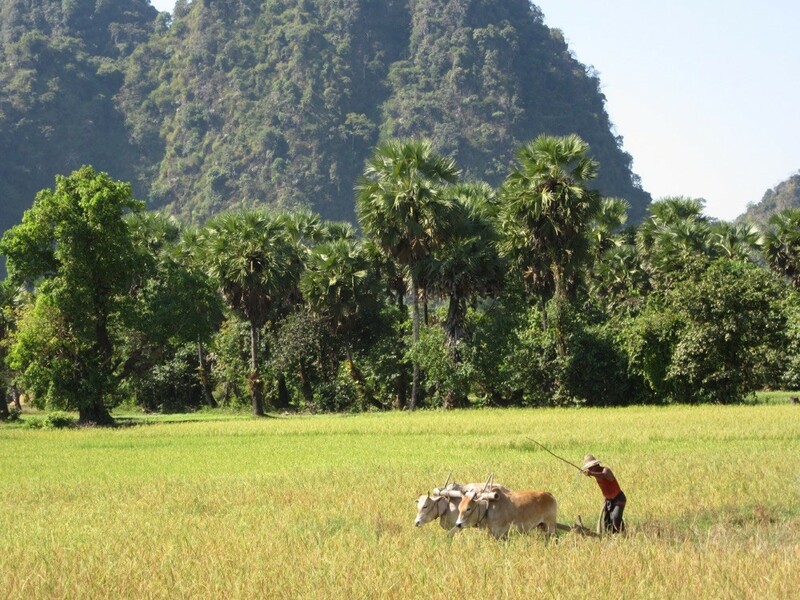 Hpa An was fantastic. 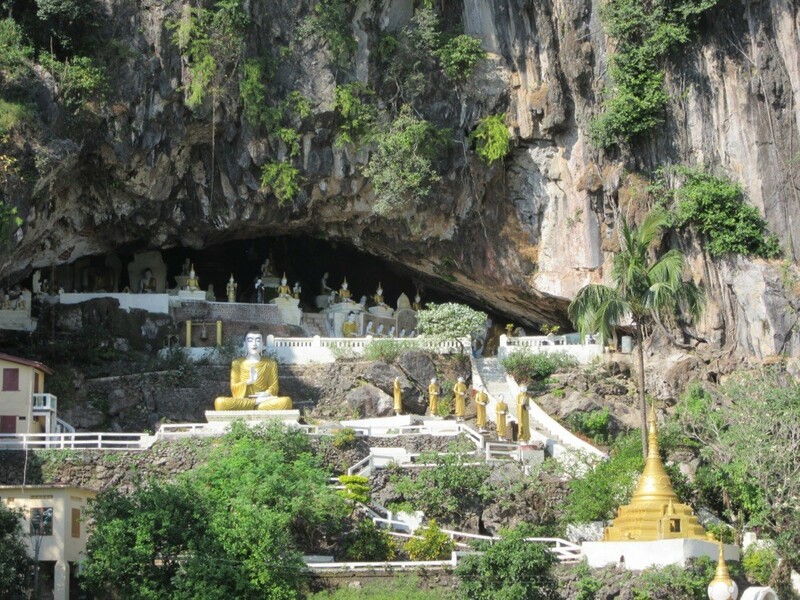 There are so many caves with Buddhas. We took a day tour with sightseeing. We were fascinated but also a bit shocked that even in holy places there was so much garbage. Stupas and Buddhas wherever you looked I guess there are golden temples all over the country. The nice thing about cycling is that you are close to the people and can stop whenever you want, either to talk to the people or to take photos. They are so friendly. I smile the whole day because everybody greets you happily. 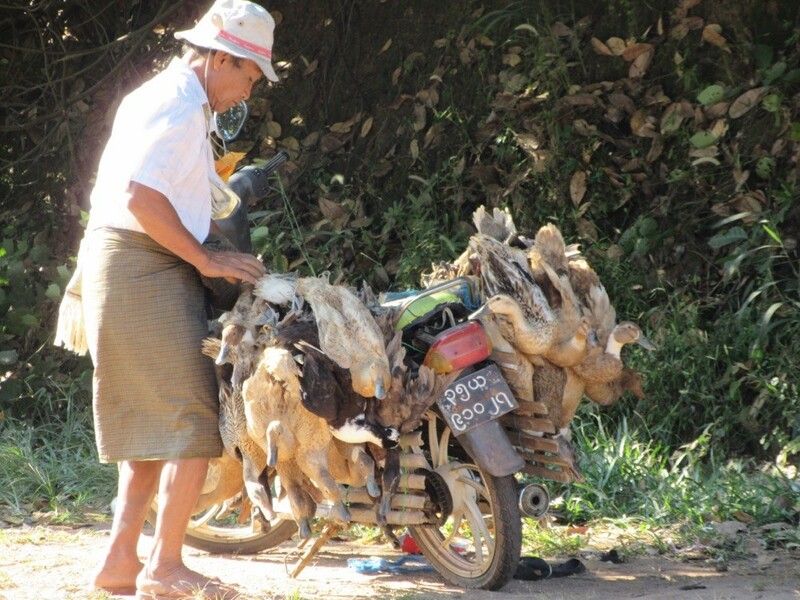 Sometimes you see strange things like this guy who transports living geese on his scooter! Poor geese. They do the same with chicken! I love the local markets and I try to learn about new fruit. When I " asked" about these, the women started laughing. 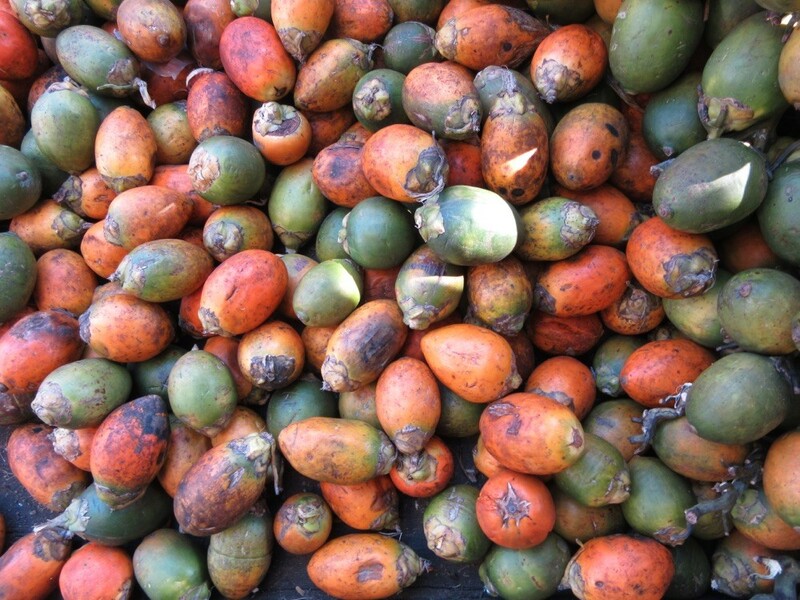 It is bethel nut, something they chew and then spit out again ( iggy ) to feel better. But the result is that they look like Dracula and ruin their teeth. And everywhere are red spots on the ground. Not very nice. 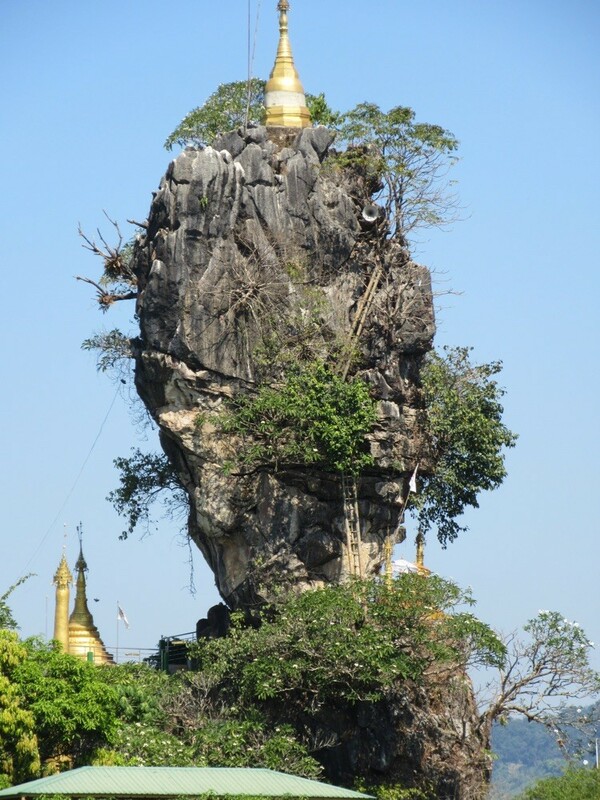 Then we cycled to the famous golden rock, one of the holiest places in Myanmar. There are about 10000 pilgrims every day when it's main season. They are taken up on the back of lorries, 60 people squeezed for 45 minutes. And the ride is like a roller coaster, a bit more scary because it is real. But it was an adventure I won't want to miss. 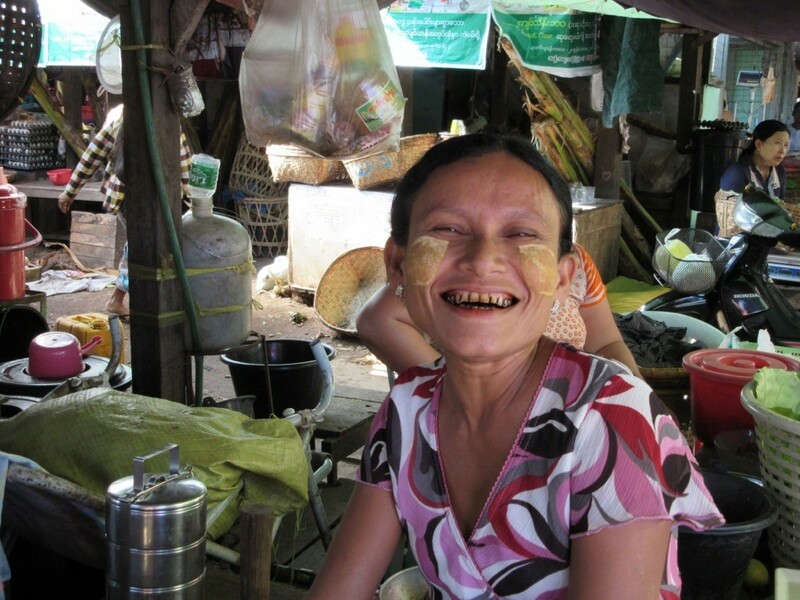 The next day we cycled to Bago which was 108km in the heat. This is the dirtiest and noisiest city ever but it has some nice sights and we had a guide who took us around on his scooter so we got to see places we wouldn't have found on our own. Tonight we will go by bus to Inle Lake. 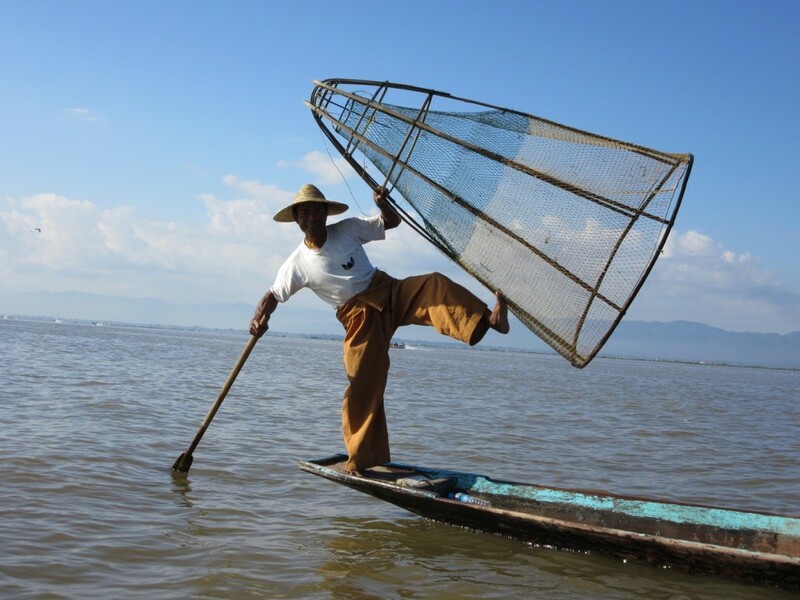 Inle Lake is famous for its fishermen who stand on one leg and paddle with the other in order to have the hands free for fishing, ( this one posed for the tourists though). But it was so amazing! 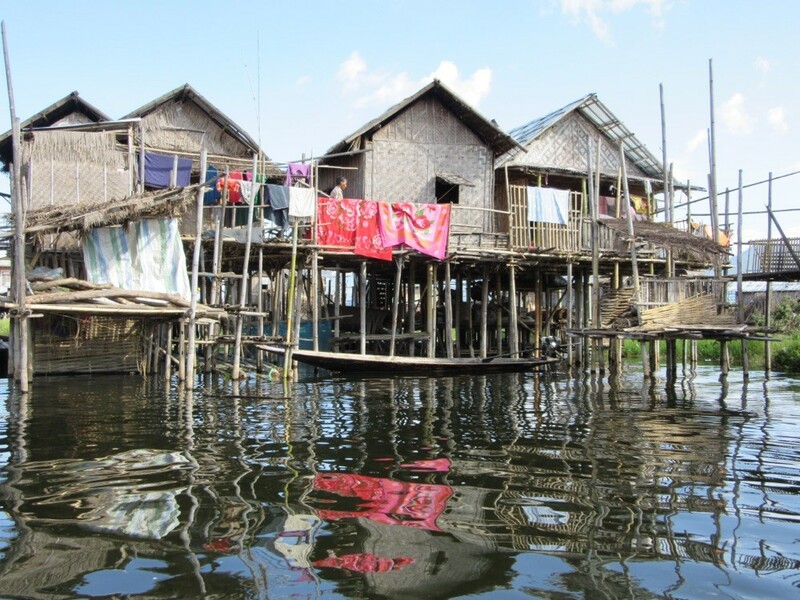 They have a village in the middle of the lake ( it is only two to three meters deep) and also floating gardens where they grow vegetables, mainly tomatoes. 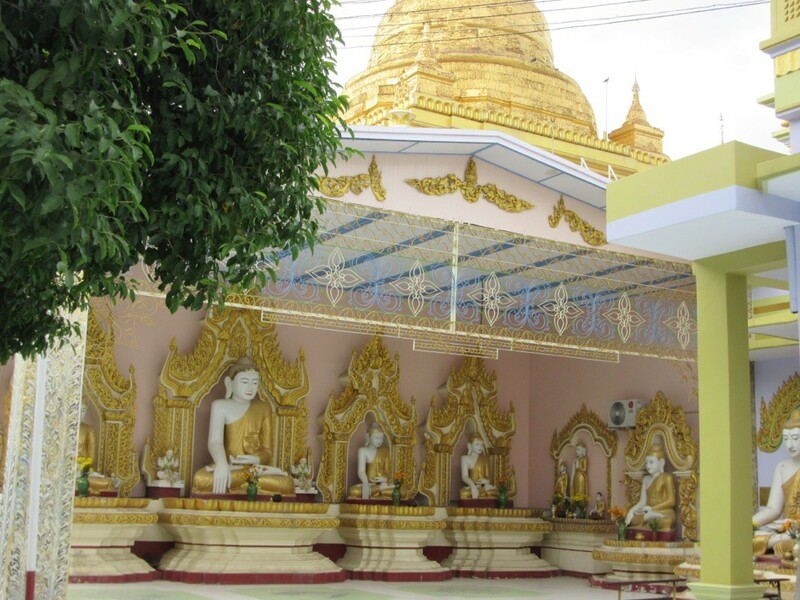 Then we stopped at the village Indein where there were more than 560 pagodas. It looked beautiful and I liked the sound of the little bells at the tops. 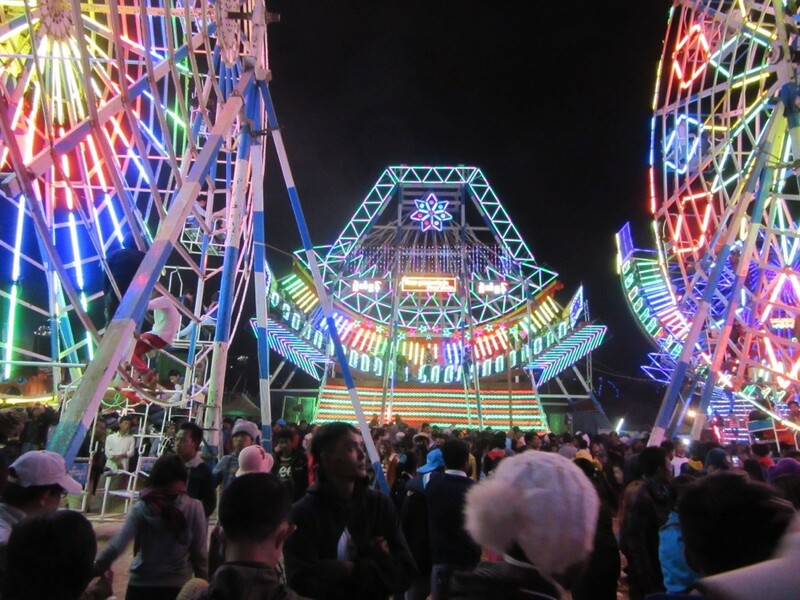 We were also very lucky to be in the area at full moon in November as that is the time for the Taunggiy ballon festival. 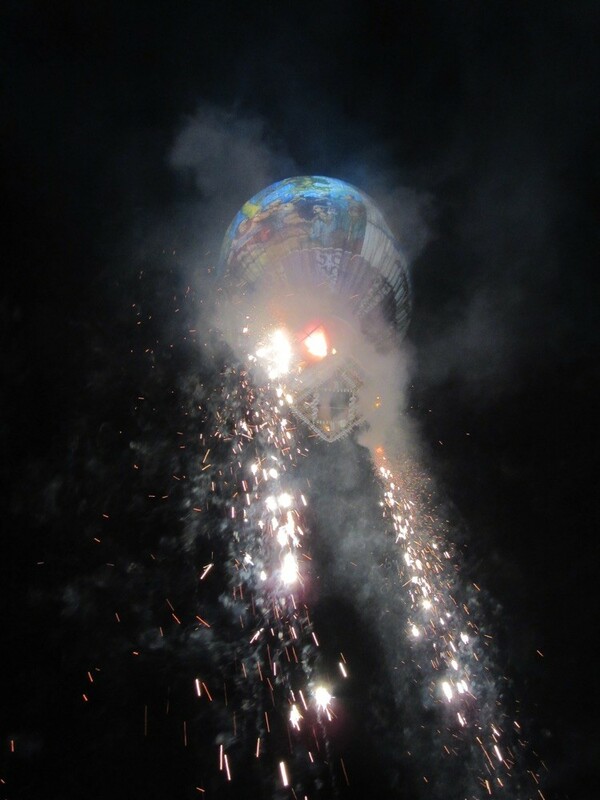 They make the balloons themselves and equipe them with fireworks and when they rise the firework starts. Beautiful. They also had a fair with ferry wheels and pirate ship which they moved with manpower! Really amazing! 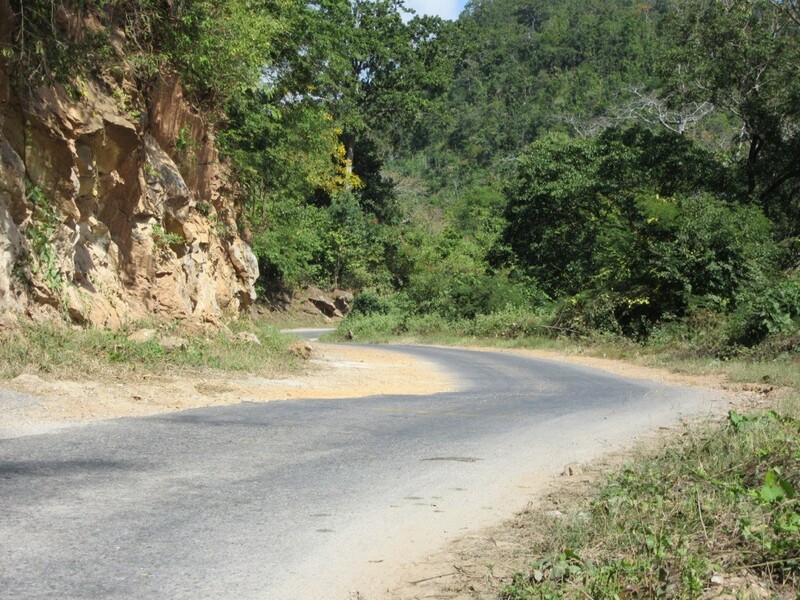 Then we cycled to Kalaw, a mountain resort which the British liked for its cool air when they were in the country. We went on a wonderful hike to a tiny little Nepalese restaurant on the top of a hill. In the evening we were lucky again as there was another festival going on. 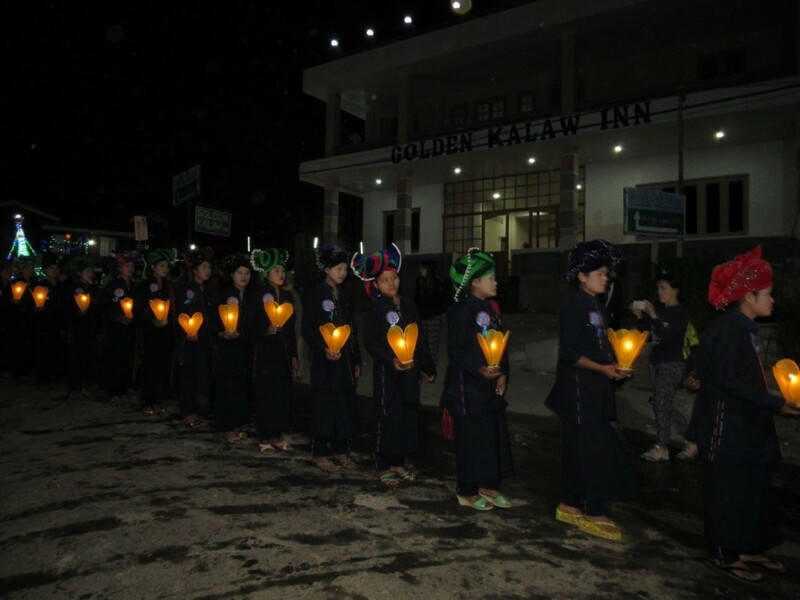 The people made a parade with the girls carrying lanterns and the boys making loud music with drums and dancing wildly. It ended in a stadium with bonfires and fireworks. Time to go on to Mandalay! 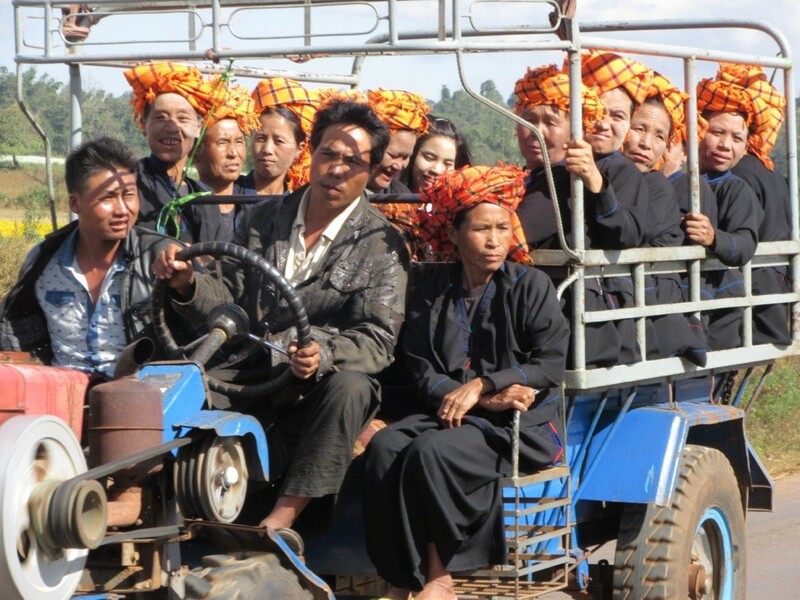 The first day it was mainly rural area where we could watch people harvesting cauliflower and rice and saw many trucks with people or goods on the road. The next day we came through mountainous area, beautiful. And we were so glad that we already were up and just had to go down though even that was exhausting because you had to concentrate and pull the brakes all the time. Finally reaching the highway we decided to take the "tuk tuk" to Mandalay as the traffic was bad. 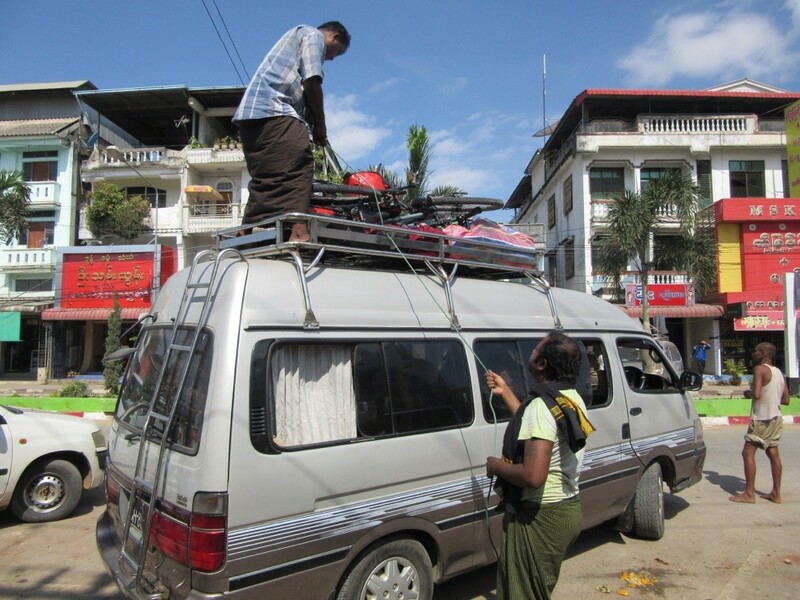 Bicycles on the roof and off we go to Mandalay. Mandalay is noisy, dirty and the traffic is amazing, there seem to be no rules. The one with the loudest honk goes first. 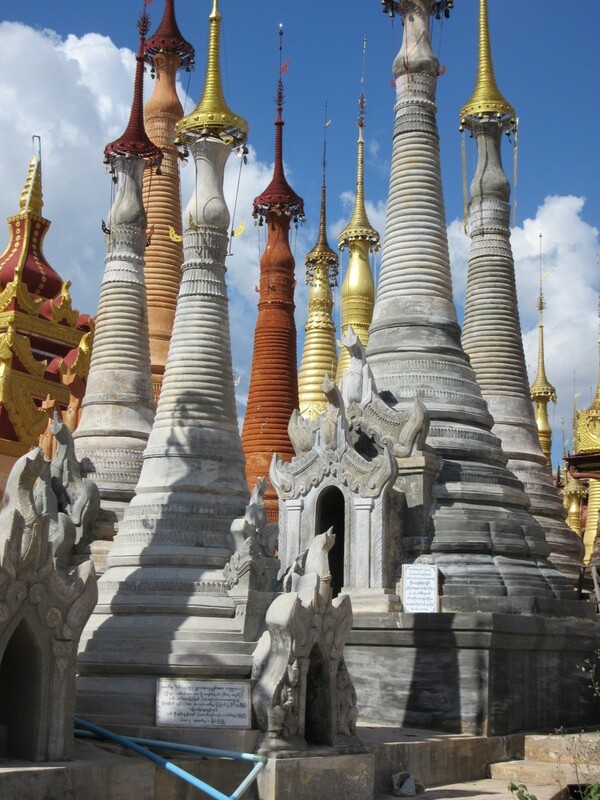 But there are also many beautiful pagodas. 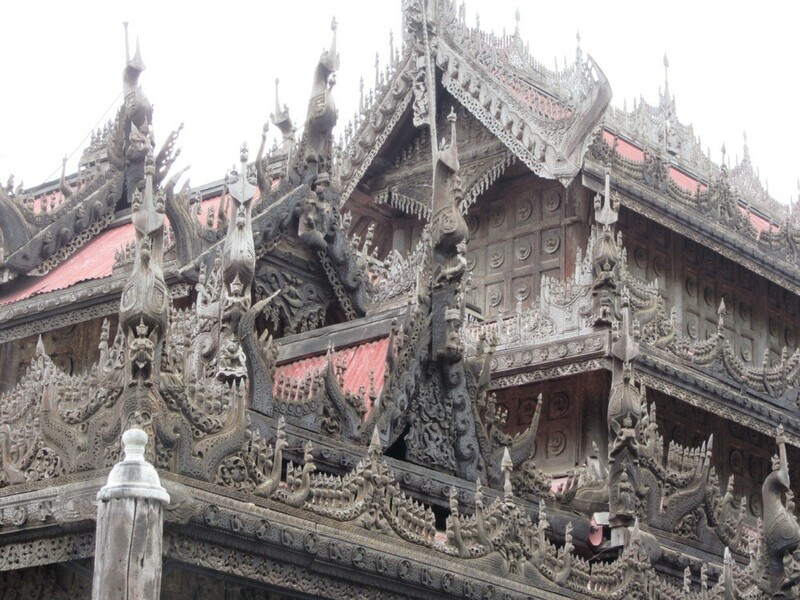 I especially liked this very old teak monastery with its wood carvings all over the house. I also tried the traditional Tanaka, something that nearly everybody here puts in his or her face. 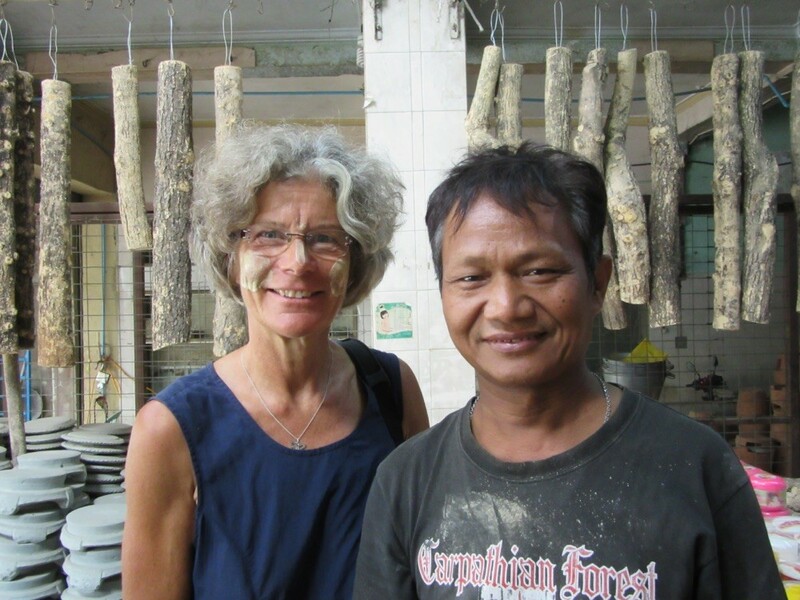 It is made of wood and works like sunscreen and is supposed to be very good for your skin. 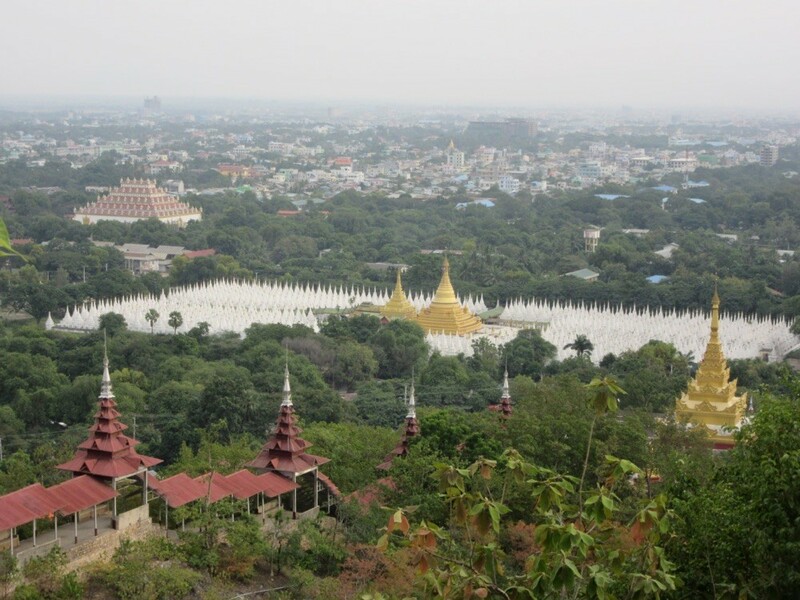 Later that day I went up Mandalay Hill from where you have a wonderful view of the pagodas at the bottom of the hill. Here you can see the biggest book of the world, more than 700 mini pagodas with engraved stones in them with buddha's book. Unfortunately it rained the next day so we haven' t got beautiful photos of the famous U Bein bridge, longest teak bridge of the world, but it was nice walking ( you had to push your bike ) across it and meeting the Burmese who seem to love this bridge because they were constantly taking photos. 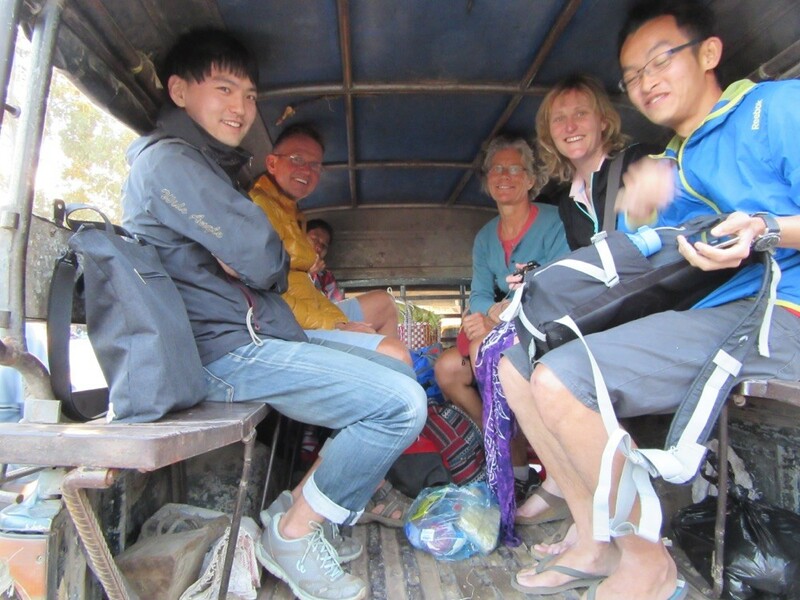 Friday, 4th December, we left our bikes in the hotel in Mandalay and took a bus up to Hsipaw. The narrow winding road there is just crazy with all the big old trucks going to China. 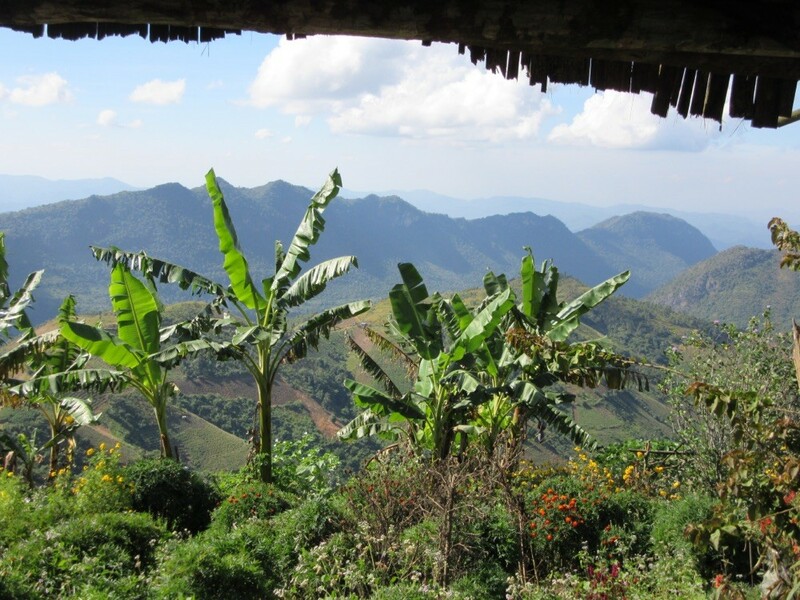 You can do nice hikes in Hsipaw but they are not well marked so I lost my way and better stayed in the village walking around . I came upon this little school and sang a song , which the kids found funny. 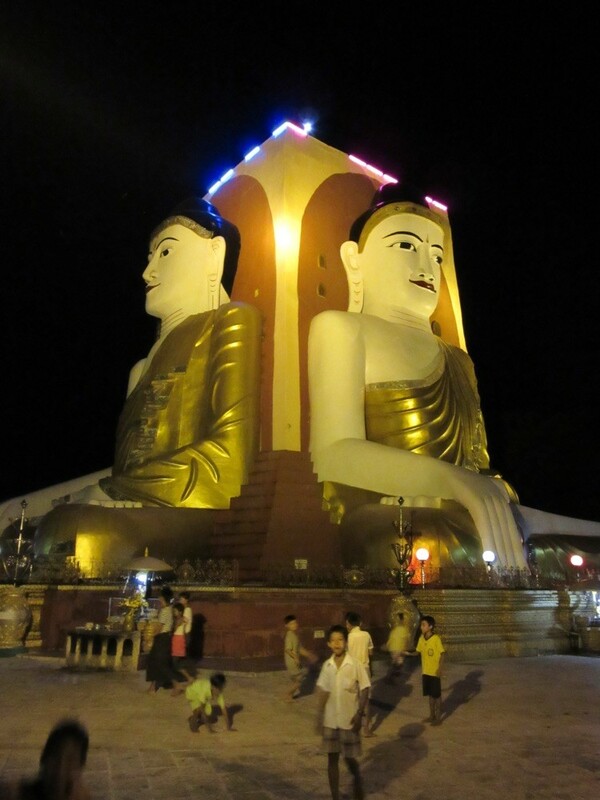 On Sunday we went back to Mandalay by train which was a real experience. It was swaying so much you constantly though it would come off the rail. Sometimes it was so bumpy you were kicked out of your seats which luckily were more comfortable than expected n the upper class. One of the reasons to take this train is this famous viaduct built by the English around 1900. It es very high and very beautiful and there were also lots of tourists standing next to the rails to take photos of the train which we could not do as we were on the train. 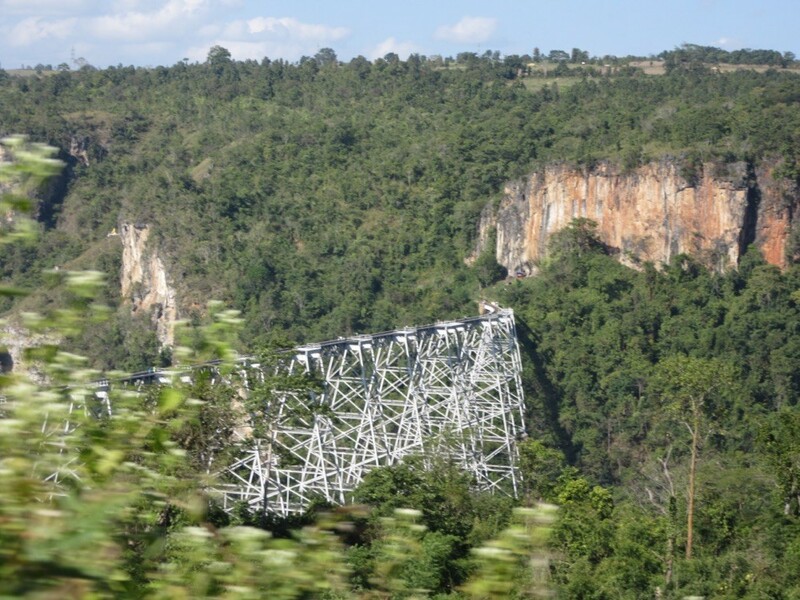 As the train was very slow ( while being on it you could have stolen vegetable from the fields next to the rails) we decided to get off at Pyin Oo Lwin ( 7 hours for 140 km) and take a tuk tuk for the last bit to Mandalay. After this photo was taken 7 more people got on and 3 big bean bags. That is Myanmar. 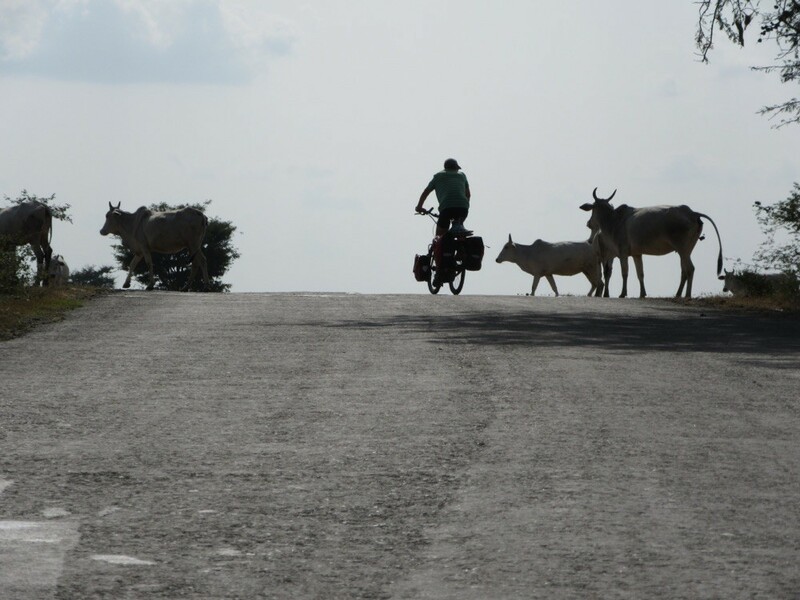 Then it was time to go on to Bagan which took us two days on the bike. Again fantastic days through wonderful landscape and I enjoyed every second. Meeting people who work in their fields like n medieval times is amazing. 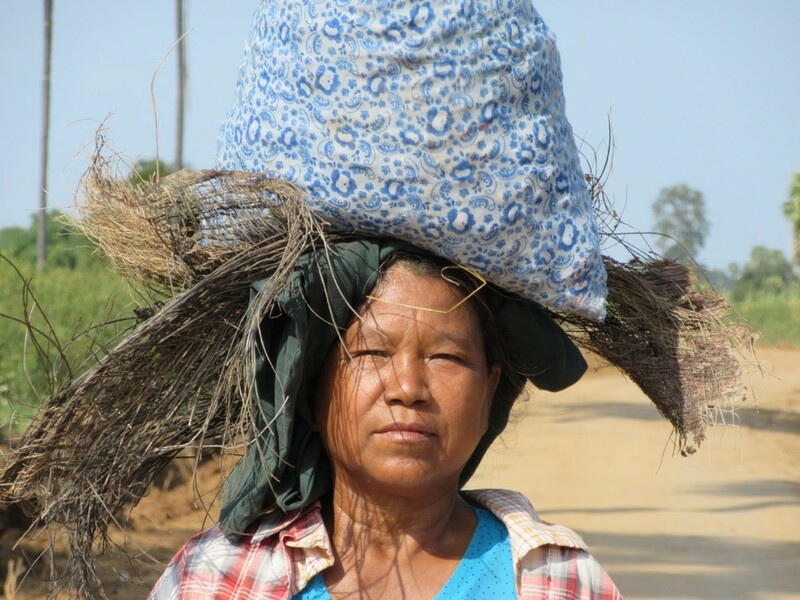 Women carrying their goods on their heads for hours. 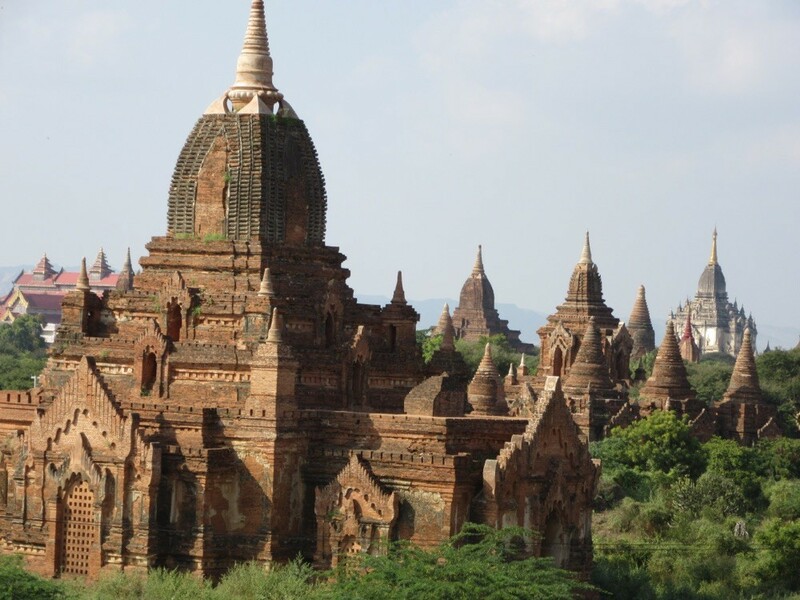 Bagan was amazing, more than 3000 stupas and temples in the area, we only had two and a half days but t was fn to go around by bike and see places which normal tourists won't see. The best experience though was the sunrise, even if I had to share it with many other tourists n the highest pagoda early in the morning. 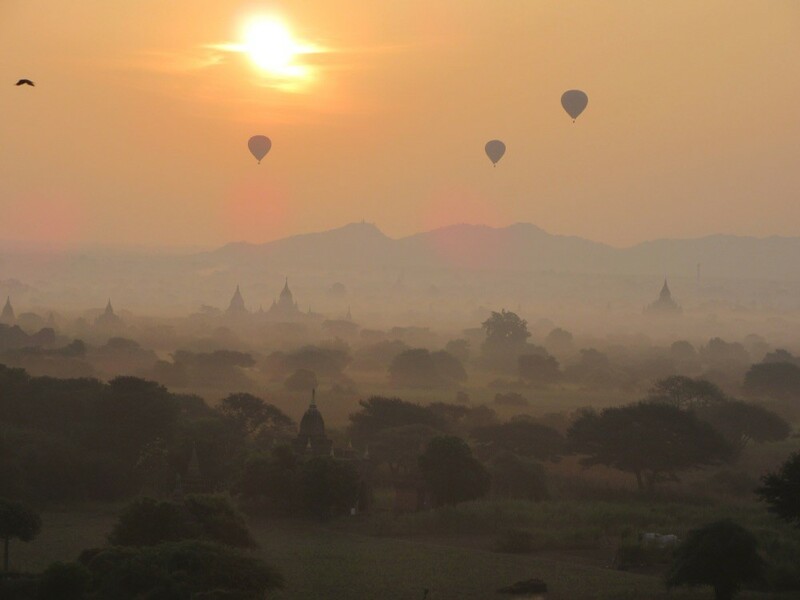 And then 13 balloons floated over the pagodas in the morning mist. Fantastic! Then it was time to go on to Yangon by night bus where we found a nice hostel in the city center. But when we were having a rest after lunch we suddenly heard a chorus shouting in the street and after a while I went to look what was going on and saw this horrible scene. I remembered that I had heard about a religious ritual that involved hurting yourself and googled it. Shiites do that after a 10 days period of mourning in honor of the third Iman Husein, a maryr, who was killed 680 in Kerbela. It was disturbing to see it right n front of our hostel (they did it here because there was a mosk in the street). 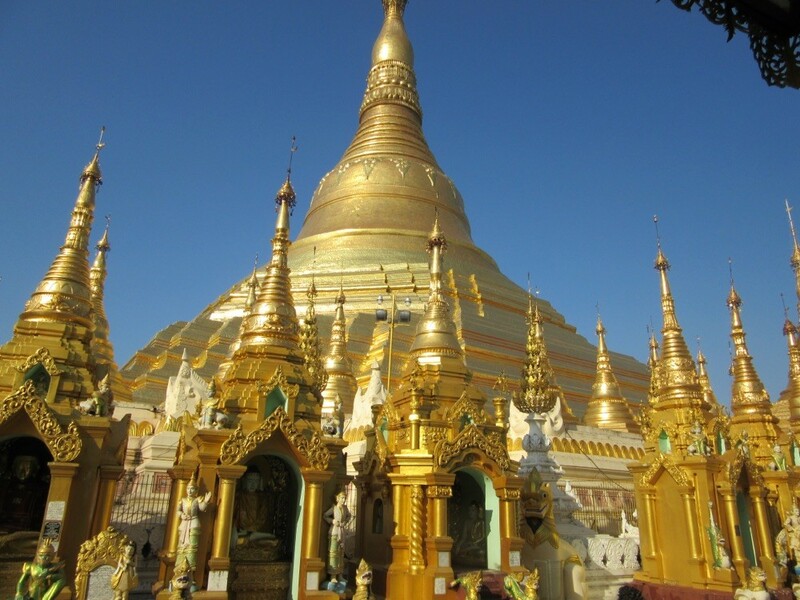 After this horrible experience we wanted to see something nice and went to the holiest place n Myanmar, the Shwedagon Pagoda and it definitely was the most impressive place we have seen so far. So much gold n one place! And the atmosphere was so nice, many people, locals as well as tourists wandering around, marveling at the sights. 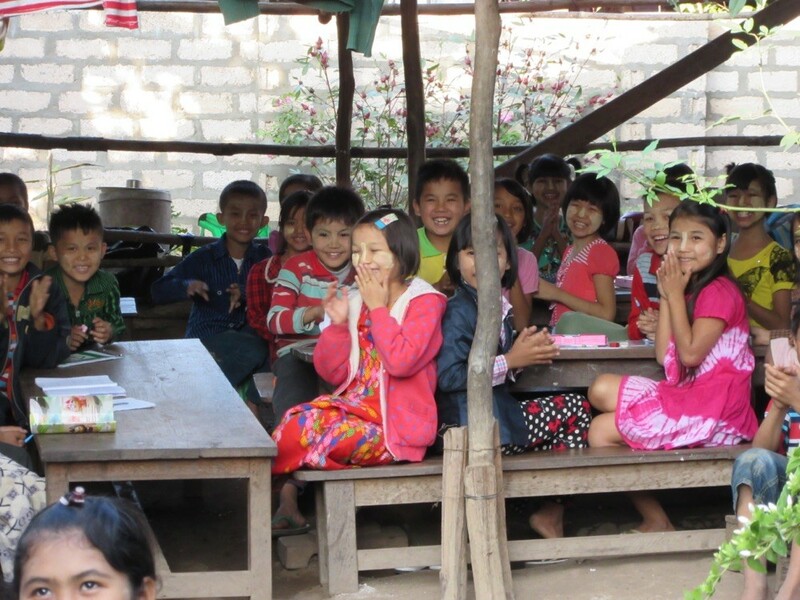 And there are many Burmese students who want to talk to you in order to improve their English. I had two girls accompany me and we had so much fun. Arne talked to a young man about civil engineering. So we had a really nice afternoon and I even saw the sunset from up there. 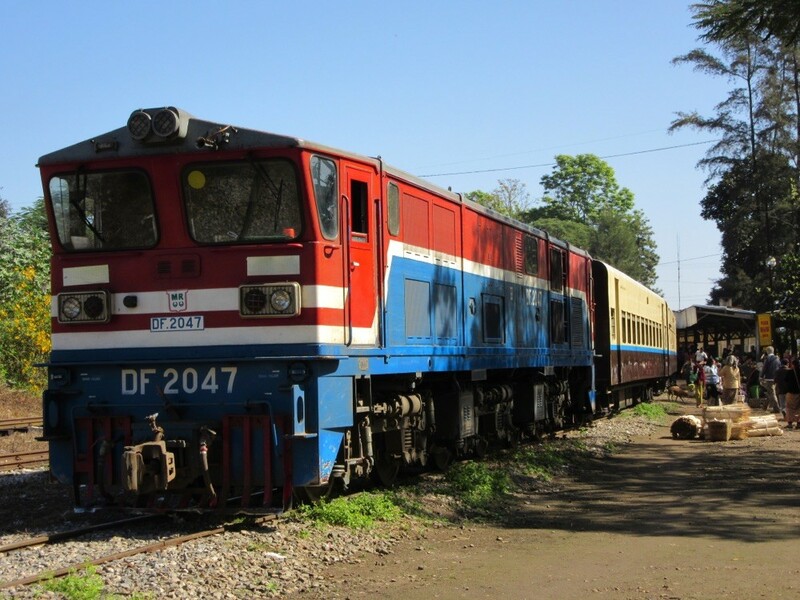 On Sunday, 13 th December, we went by train to Mawlamyine, 270 km in 10 hours. 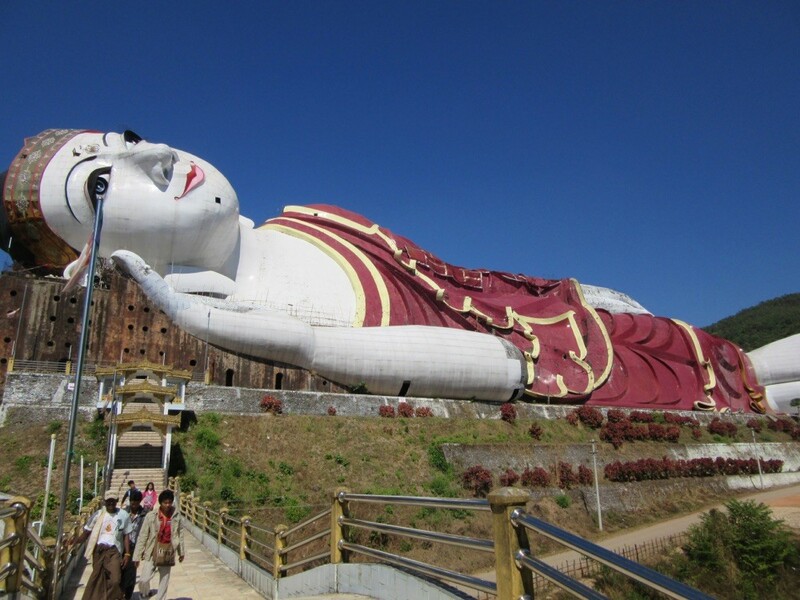 Ther we saw the biggest reclining Buddha of Myanmar. Inside you could learn about Buddha 's life. 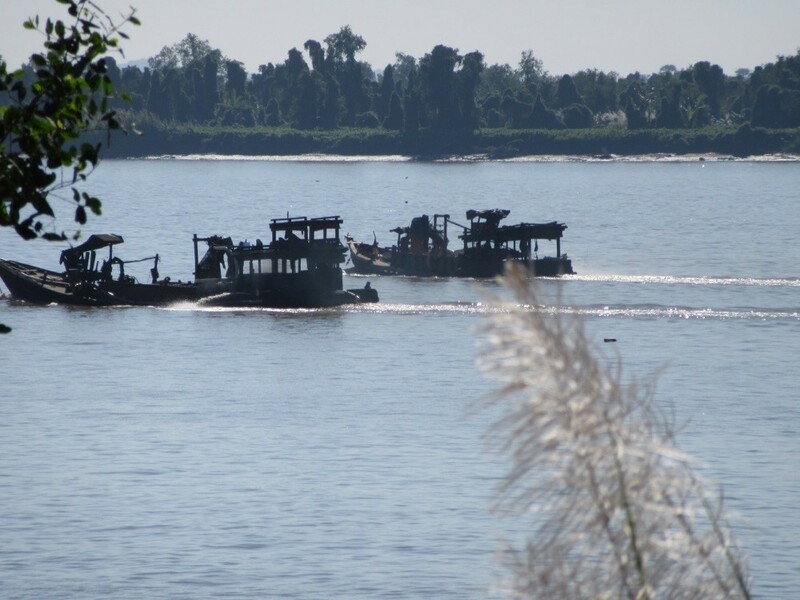 But the best thing about Mawlamyine was the river and as our hotel was close to the jetty our favorite part was watching the arrival of the ferry. 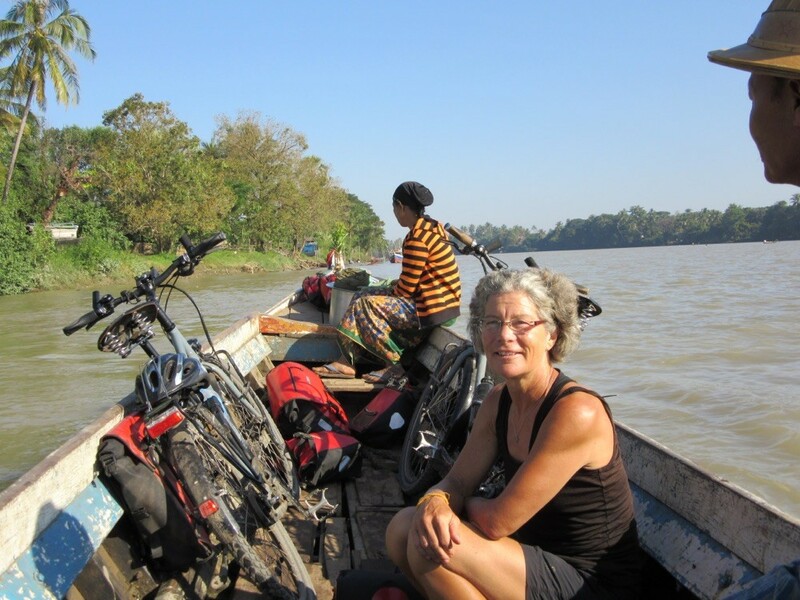 On our last day of cycling Arne lost his way so we had to cross the river with this small ferry which was lots of fun. I guess not many "falangs" were seen there before as we were the great attraction. 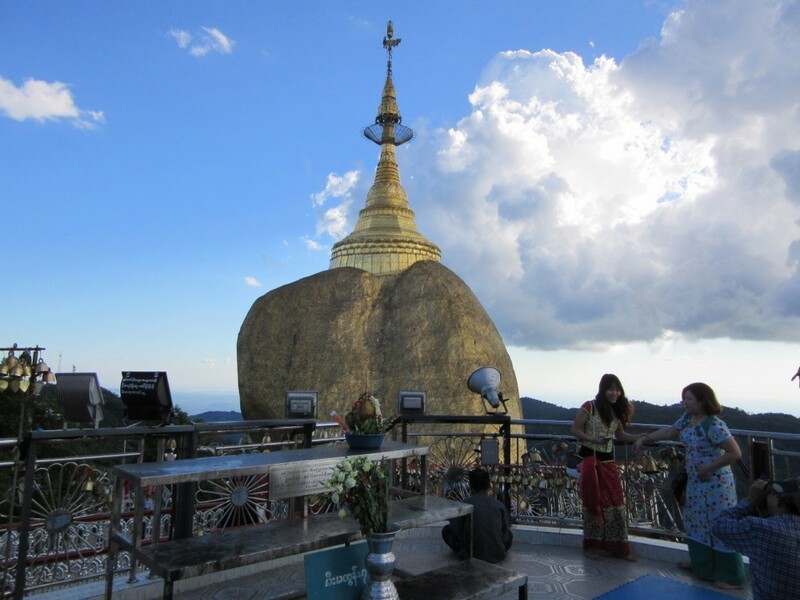 On the very last day before returning to Thailand I climbed a steep mountain with a pagoda on top. Beautiful view but 3000 steps up and 3000 steps down again. So today I have really sour muscles in my legs. 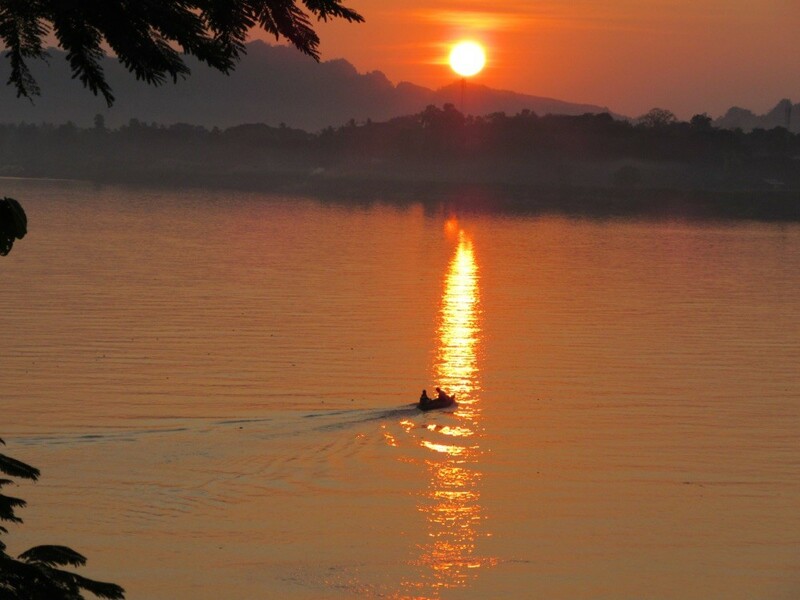 The very nice end of our wonderful time in Myanmar was the sunset at the pagoda near our hotel in Hpa An. We are so glad that we could visit this amazing country before it changes due to too many tourists.